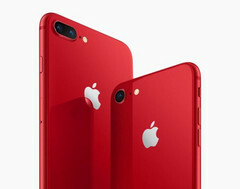 Apple has announced the impending release of the Product Red Special Edition iPhone 8 and iPhone 8 Plus. The devices will be available to order from April 10 and physical units will start appearing in Apple stores in some countries on April 13. The Special Edition smartphones will come in an eye-catching red finish. Part of the money made from selling these devices goes to The Global Fund financing organization. The Special Edition devices have the same specifications as Apple’s regular iPhone 8 and iPhone 8 Plus. 64 GB and 256 GB models will be made available and prices will start at US$699 from the official Apple online store. A Product Red iPhone X Leather Folio will also be made available from April 10, priced at US$99. Product Red, which is sometimes stylized as (PRODUCT) RED, gives the money it makes from sales of a wide variety of specially licensed products to The Global Fund to Fight Aids, Tuberculosis and Malaria. Apple has partnered with Product Red in the past and released a number of red-colored devices, including the iPhone 7 and iPhone 7 Plus. April 13: Australia, Canada, China, France, Germany, Hong Kong, Japan, New Zealand, Singapore, the UK, and US. Later in April: Brazil, Denmark, Ireland, Italy, Malaysia, Mexico, Netherlands, Norway, Russia, Saudi Arabia, South Korea, Spain, Sweden, Switzerland, Taiwan, Thailand, UAE, and other countries and regions. May: Chile, Colombia, India, Israel, Turkey, and other countries and regions.